I finished plying the last of my yarn! I was originally going to call this an FY (finished yarn) instead of an FO, but then I immediately thought to myself, "For Your what?" and then I couldn't think of anything yarn related for the "I", so I dropped that idea. Anyway, the first three pictures were taken at night, so the color is pretty bad. I don't know how much it weighs because I don't own a scale, nor do I own a niddy-noddy or skein winder, so it was a bit difficult to measure yardage as well. I used this super inaccurate method of using my umbrella swift and attempted to size it so that one wrap all the way around was equal to 1.5 yards. Then I wound the cake back onto the swift and then actually counted how many times the yarn wrapped all the way around it. Not so accurate, but close enough for my needs. If you're curious, I have an estimated yardage of 245yds, 12 wpi. I'm not sure what any of that says about the actual weight of the yarn, but I would say it's sport/dk/light-worsted-ish (I know, super specific). 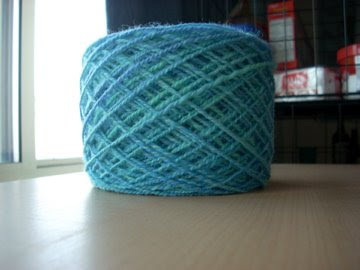 I'm really excited to make something with this yarn. I don't actually know what fiber it is other than "wool", but it's not the softest thing in the world. Any ideas for what I could do with it? I'm excited to make my next yarn even better. This one seems a little bit, well, no, you know what? I take that back. I was going to say it seems insubstantial (in the sense that it lacks substance, duh) and I was going to say that maybe it has to do with the amount of twist I put in the singles and consequently the plying, but I think it has more to do with the way I was drafting. It's not dense because my singles were somewhat airy (semi-woolen drafting). However, does anyone know, if I were to put more twist into my singles (something that, judging by how much twist I had put in these, seems unnecessary) and then more twist in my plying, would I get a denser, sproingier yarn? I mean, don't get me wrong, this is plenty sproingy, I was just curious. Is it more blue than green? Or more green than blue. I am very confused... as usual. 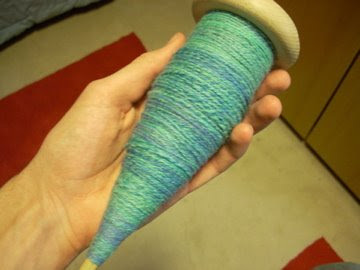 Wonderful job on the spinning! Haha! Cookie's asking you about colors. That's hilarious. Also, I think 12 wpi is considered a worsted weight. The yarn is beautiful! To answer your question about twist- adding more twist as you spin the singles and ply will make a stronger yarn, but if you overtwist the yarn can lose some of it's softness and springiness, sometimes becoming almost hard (especially when spinning animal hair- like mohair). 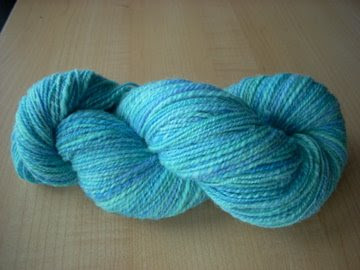 It definitely is a trial and error process to learn how you like your yarn. When I am working with a new fiber I usually spin and ply a few yards of yarn just to see if I like the way it is turning out, or if I want to alter what I am doing. Your yarn looks lovely, and I would be quite pleased with it. 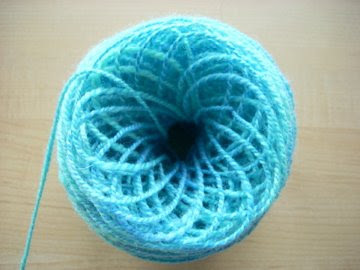 Wow - great job on your first "real" yarn! Lots of things you could do with it. Fingerless mitts? Or a neck warmer maybe? I'm betting it's still plenty cold in WI for warm accessories. If you add more twist, you probably won't get more bounce to the yarn. A lot of it has to do with the wool you started with too. From the pictures you've posted, I think the skein you've got will be a great knitting yarn - lightweight, with some nice memory to it. Wow -- it looks wonderful!! Smooth and even, with a nice, tight twist -- me likes bunches. :-) That's a cool pic of the flower/ball. Sorry, no help here on the substantialness or lack thereof. I'm still trying to figure it out too. Maybe try playing with a worsted draw? Things I learned today from Googling things on your post: what a niddy-noddy is, how to measure wpi. You're a wealth of wittily-delivered lowdown for a newbie to spinning. Love the color mix and the pretty twist. I think it looks perfect, and your detailed pics are great. Nice flower at the end - way to create your own sunshine. The yarn is beautiful!! I love the color. Hey there. Well, I guess it's me who's lousy at responding now:) This is Paul who posted about the crochet squares, but I decided to change my usual post name to my real name that day (I really don't know why, everyone already knows me as pj anyway. Just can't leave well enough alone, lol.) I just noticed today that you took the time to reply in your post! Sorry to complicate things! Your yarn looks excellent btw, wonderful color and texture:) Also: your knitting MORE than makes up for anything you may lack in crochet! 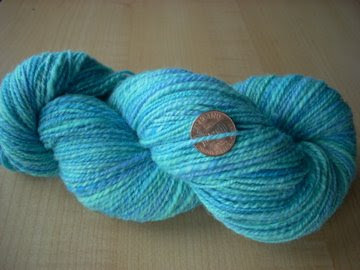 Wow, that is some seriously beautiful handspun! 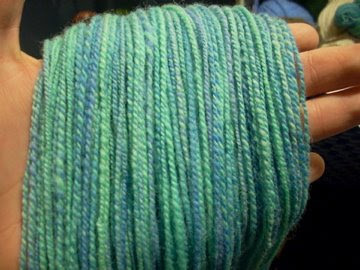 That is a very pretty yarn! 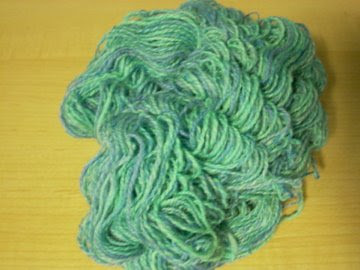 You actually don't want to add more twist, it will make the yarn hard, and will not add bounce. Some wools are more bouncy (elastic) than others. Merino is more bouncy than BFL, for instance. 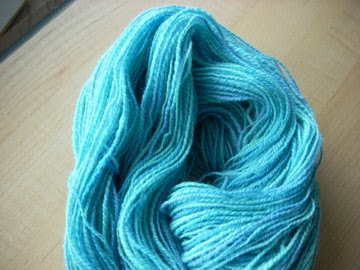 - like, if you have a strand of merino sock yarn, pull it and watch how stretchy and sproingy and elastic it is. BFL on the other hand, doesn't act that way, and never will, it's just a quality of the wool. Merino has more crimp in the locks, which equals more bounce. Also, if you add more twist, getting a harder yarn, it will be very unpleasant to knit with. Painful, even. Like knitting twine or rope. Not fun, imo. Why do you want a dense yarn? 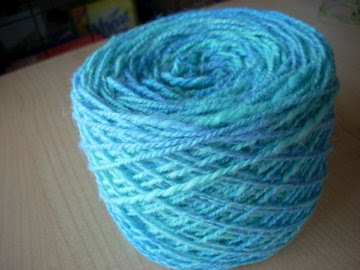 Yarn that is light and airy is very nice to knit with and wear - yarn that is woolen spun has lots of nice air pockets to trap the air and keep you warm. Hats, mittens, fingerless gloves, colorwork yokes are all great for handspun. Thorpe (hat) is a nice one for handspun. Also, niddy noddies are quite cheap and make the job of winding a skein really quick and easy - Ashford niddy noddies are about $15, and then you can measure yardage accurately too.